Adds up to a revelatory trip into complex, innovative ideas and altered perspectives on how people think. Blends thoughtful analysis with frequent doses of lighthearted humor. 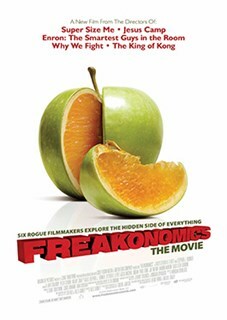 In 2005, economist Steven Levitt teamed up with journalist Stephen Dubner to bring us the best-selling phenomenon “Freakonomics”, a revelatory investigation into the hidden side of everything that introduced us to a new way of understanding our world. Now, six rogue filmmakers behind some of the most acclaimed documentaries in recent years have brought Levitt and Dubner’s groundbreaking vision to life, compiling a series of fascinating, visually arresting and often hilarious case studies that prove the key to unlocking the mysteries of everyday life lies in one very important question: what’s the incentive?